Scientists Visit the Wild West. 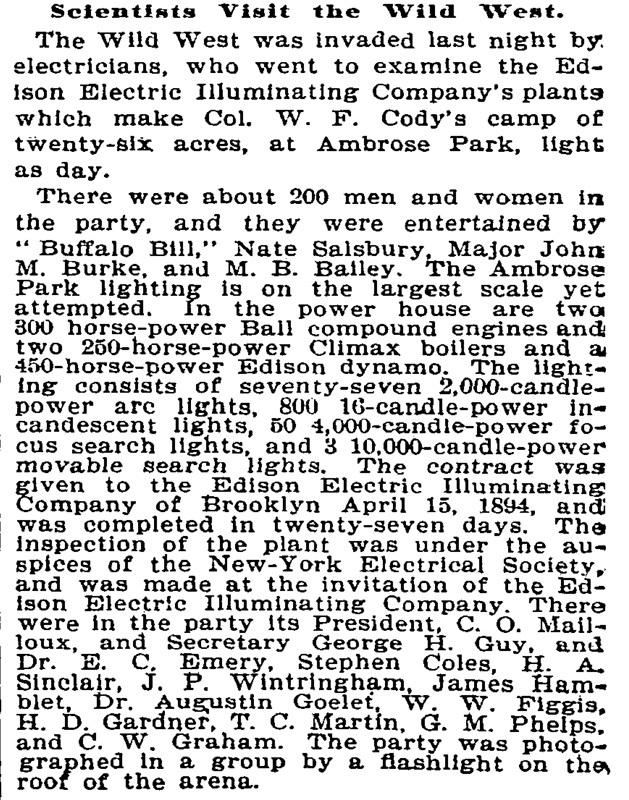 The Wild West was invaded last night by electricians, who went to examine the Edison Electric Illuminating Company's plants which make Col. W. F. Cody's camp of twenty-six acres, at Ambrose Park, light as day. There were about 200 men and women in the party, and they were entertained by "Buffalo Bill," Nate Salsbury, Major John M. Burke, and M. B. Bailey. The Ambrose Park lighting is on the largest scale yet attempted. In the power house are two 300 horse-power Ball compound engines and two 250-horse-power Climax boilers and a 450-horse-power Edison dynamo. The lighting consists of seventy-seven 2,000-candle-power arc lights, 800 16-candle-power incandescent lights, 50 4,000-candle-power focus search lights, and 3 10,000-candle-power movable search lights. 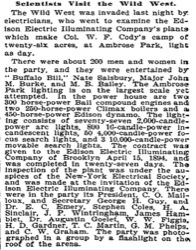 The contract was given to the Edison Electric Illuminating Company of Brooklyn April 15, 1894, and was completed in twenty-seven days. The inspection of the plant was under the auspices of the New-York Electrical Society, and was made at the invitation of the Edison Electrical Illuminating Company. There were in the party its President, C. O. Mailloux, and Secretary George H. Guy, and Dr. E. C. Emery, Stephen Coles, H. A. Sinclair, J. P. Wintringham, James Hamblet, Dr. Augustin Goelet, W. W. Figgis, H. D. Gardner, T. C. Martin, G. M. Phelps, and C. W. Graham. The party was photographed in a group by a flashlight on the roof of the arena.